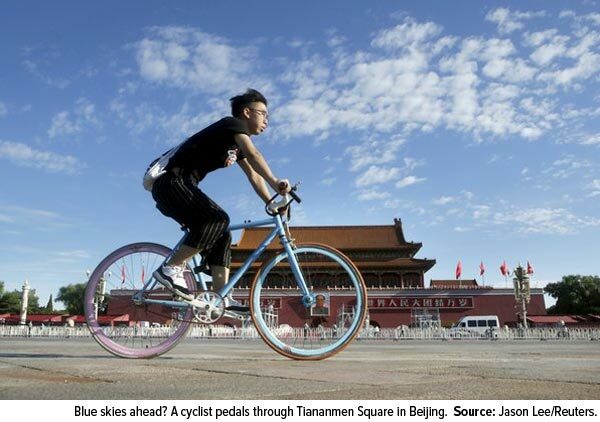 The photo you see below was snapped recently in Beijing. It might not be that special to some readers, but in my 25 years of visiting the Chinese capital, I’ve never seen a blue sky because it’s always been blotted out by yellow smog. Beijing is clearly undergoing a massive transformation right now. This might please proponents of the green movement, but it’s ultimately harmful to the health of China’s manufacturing sector. On the other hand, blue skies could be ahead for China’s service industries. Don’t get me wrong. These events are indeed significant and have real consequences. They also make for some great, sensational headlines, as I discussed earlier this month. You can see that the world’s second-largest economy has begun to shift away from manufacturing and more toward consumption and the service industries. While the country’s purchasing managers’ index (PMI) reading has been in contraction mode since March of this year, the service industries—which include financial services, insurance, entertainment, tourism and more—are ever-expanding. 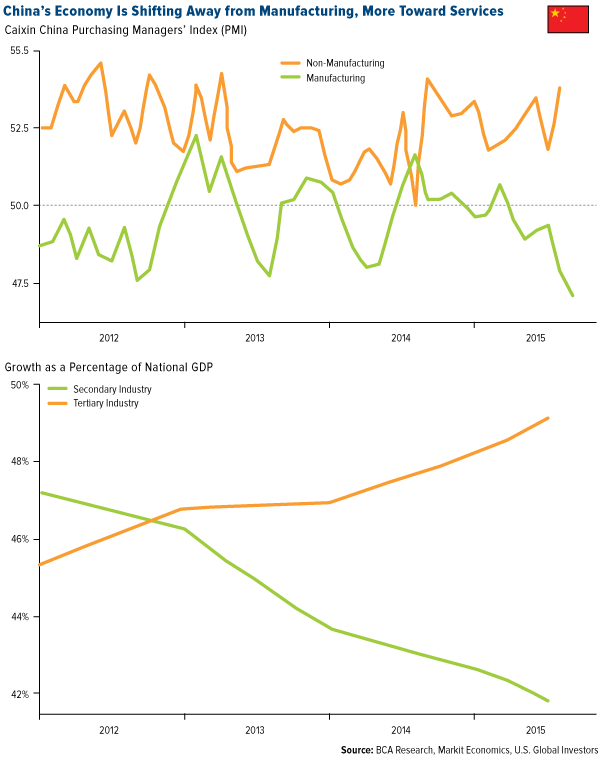 The problem is that the transformation has not been fast enough to offset the massive size of the manufacturing sector. Just as a refresher, the PMI is forward-looking and resets every 30 days. It helps investors manage expectations. 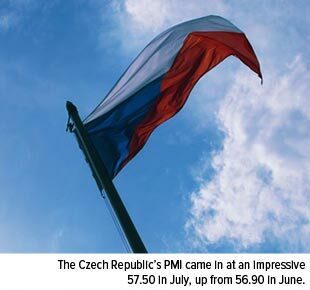 Consider this: The best-performing country in our Emerging Europe Fund (EUROX) is the Czech Republic—which also happens to have one of the highest PMI readings. Coincidence? In China, overseas travel, cinema box office revenue and ecommerce are all seeing “explosive growth,” according to BCA. The country’s once-struggling real estate market is also robust. The government just relaxed rules to permit more foreigners to purchase mainland property. But you’d be hard-pressed to come across any of this constructive news because it’s not particularly good for ratings. The property market matters far more for China’s economy than equities do. Housing and land account for the vast majority of collateral in the financial system and play a much bigger role in spurring on growth. Yet the barrage of bearish headlines about share prices has obscured news of a property rebound. House prices have perked up nationwide for three straight months. Two months after the stock market first crashed, this upturn continues. Again, China’s transformation from a manufacturing-based economy to one that focuses on consumption has real consequences, one of the most significant being the softening of global commodity prices. As I told Daniela Cambone on last week’s Gold Game Film, gold’s Love Trade has become not a No Trade, but a Slow Trade. We’ve seen demand cool along with a decline in GDP per capita, the PMI readings and China’s M2 money supply growth. 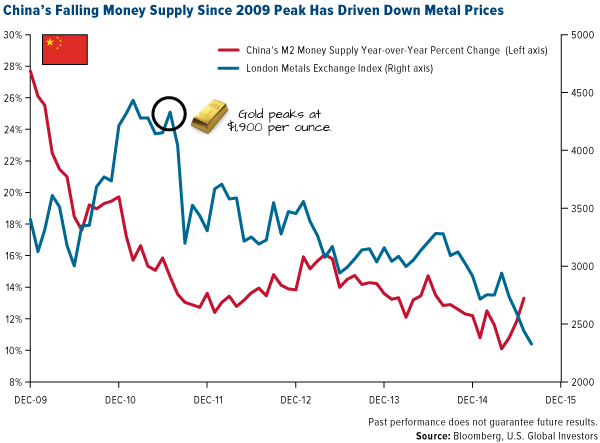 Below you can see the relationship between China’s M2 money supply growth and metal prices. Since its peak in late 2009, money supply growth has been dropping year-over-year, driving down metal prices. Money supply growth tends to be a “first mover.” When it has contracted, the PMI has usually followed. 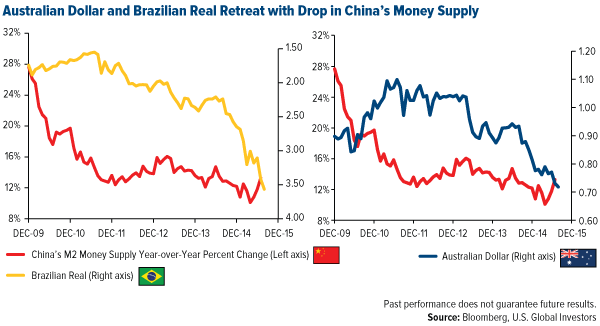 Recently, this has hurt economies that depend on China as a net buyer of raw materials, including Brazil, which supplies the Asian country with iron ore, soybeans and many other commodities, and Australia. When M2 money supply growth and the PMIs are rising, commodity prices can also rise. But that’s not what’s happening. It’s important to recognize that when new orders for finished products fall, there’s less consumption of energy to manufacture and ship. Again, this might make the greenies happy, but it’s ultimately bad for manufacturing. I’ve said several times before that China is the 800-pound commodities gorilla, and it continues to be so. The country currently consumes about a quarter of the total global output of gold. For nickel, copper, zinc, tin and steel, it’s around half of world consumption. For aluminum, it’s more than half. If you look at Chinese commodity imports over the last few months, they’ve actually been quite strong. A lot of it is just that people thought China would continue to grow at 10 percent a year, ad infinitum, and now people are just realizing that’s not going to happen. As investors and money managers, it’s crucial that we be cognizant of the changes China is undergoing. With volatility high in the Chinese markets right now, we’ve raised the cash level in our China Region Fund (USCOX), and after the dust settles somewhat and the right opportunities arise, we’ll be prepared to deploy the cash. We’re also diversified outside of China. We managed to slow the losses during the Shanghai correction by being invested in high-quality, dividend-paying stocks. 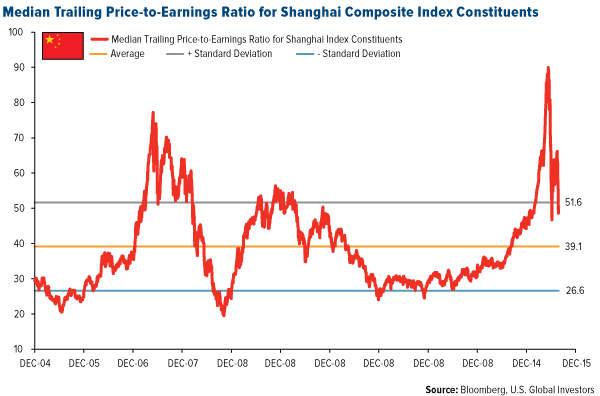 According to daily data collected since December 2004, the median trailing price-to-earnings (P/E) ratio for the Shanghai Composite Index constituents currently sits at 48.6 times earnings. 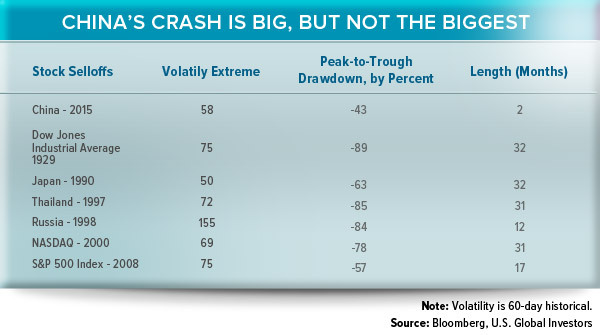 If it reverts to the mean, risk is 32 percent to the downside for the index. Currently, the P/E ratio of our China Region Fund constituents sits around 16 times. This suggests that USCOX has less downside risk and is cheaper than the Shanghai Composite. We seek to take advantage of the trend toward consumption by increasing our exposure to the growing service industries—technology, Internet and ecommerce companies (Tencent is one of our top 10 holdings); financial services (AIA and Ping An Insurance); and enviornmental services (wastewater treatment services provider CT Environmental). Rising sports participation among white collar workers in China is very visibile these days. Xian Liang, portfolio manager of USCOX, says that his friends back in Shanghai share with him, via WeChat, how they track their daily runs using mapping apps on their phones. With that said, an attractive company is Anta Sports, an emerging, innovative sportswear franchise. 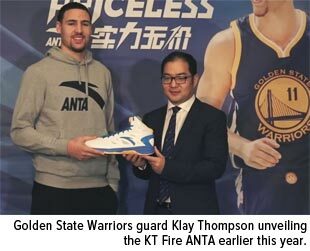 Fans of the Golden State Warriors might recall that guard Klay Thompson endorsed its products earlier this year. We believe the China region remains one of the most compelling growth stories in the world and continues to provide exciting investment opportunities. That is correct. China is not collapsing. I been saying this for months now despite the screaming media of its doom. Those who been squealing that it would collapse, will be disappointed. An easy to read article which helps the layman understand.